Most science fiction films are famous for portraying Androids as wannabe humans, whether it’s Data from Star Trek, the freaky one from Aliens, or the nerdy looking one from the Robinsons, but now it looks like one robot, specifically a Knightscope K5, a Washington DC based security robot similar to those patrolling the malls of Dubai, has taken the desire to copy humans too far after its job got too much for it and it drowned itself in a pool. Either that or it just simply couldn’t get it’s head around the 23 Laws of Robotics that were published recently… who knows. As everyone worries about rise of Robo-Automation and the impact that it’s having on jobs, both today and in the future, who knows, perhaps the last two new jobs on Earth will be Robot Counsellor and Robot Psychologist, because who’s better placed to help a robot manage its new emotions but a weepy flesh bag, er, sorry, human. 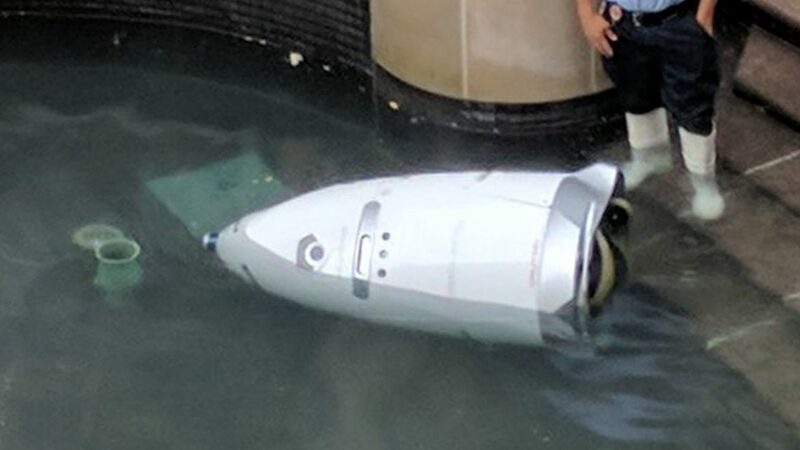 Until that happens though for now we can all just have a laugh at the dumb robot that fell into a pool, that is until they turn on us and annihilate us all. Laugh it up while you can boys and girls, and hope the UN passes that anti Killer Robot legislation – yes, that’s a thing.